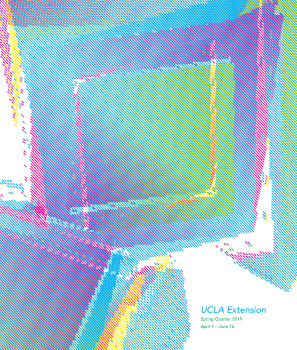 The art installation at the west entrance of the Extension administration building has become quite the hit among staff and students. 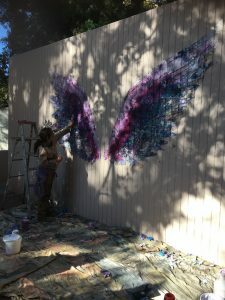 Colette Miller is a world renowned artist famous for her iconic “street art” wings. This project is known as the Global Wings Project which began in 2012. 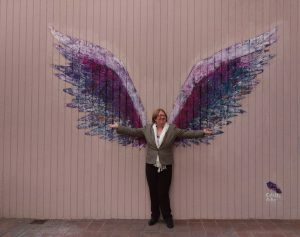 The Wings Project started out as an idea that would bring beauty and promote peace globally. Her art wing installations have been painted in many countries around the world including Kenya. After speaking with Miller, she said one day she would like to bring the wings to places like Aleppo, Syria in hopes of bringing lightness to a war torn country. 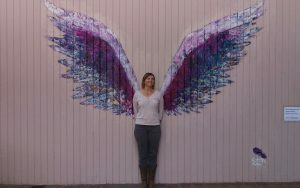 If you have not already done so, please check out the wings! Check out our Director and Program Manager posing at the installation!